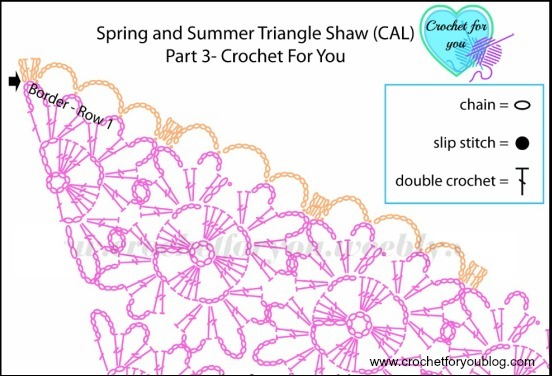 Spring and Summer Triangle Shawl (CAL) from Crochet For You. This CAL has already ended, but you can start it at any time you like. Each part of this CAL has been updated with the links >> Welcome post | Part 1 | Part 2 | Part 3 | Part 4 | Part 5. I have received lots of nice comments for this CAL. Thank you very much for every visiting, encouragement and kind comments. 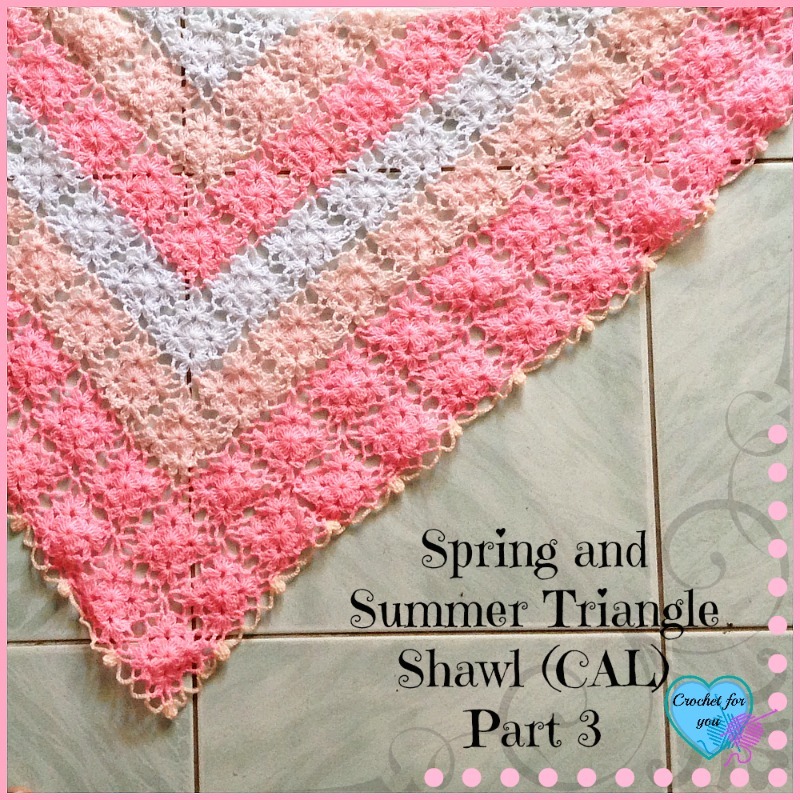 This is the part 3 of the Spring and Summer Triangle Shawl CAL. In this part, we are going to finish joining motif with 3 more rounds and then start to crochet border. I believe now you can join motif without my help, but again, I included full descriptions to make 3 rounds of joining motif. I was thanked by many of you for adding graphs and photos. 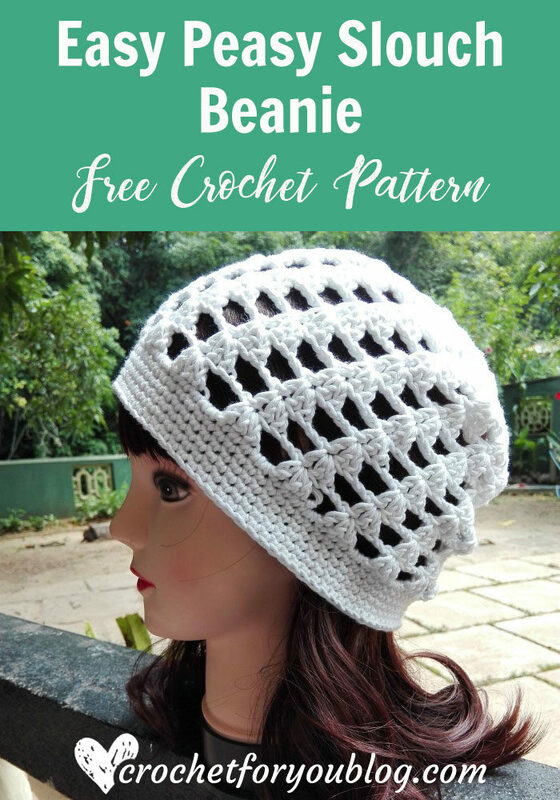 I crochet and share patterns for free with you. If the pattern can’t understand clearly, my effort would waste. 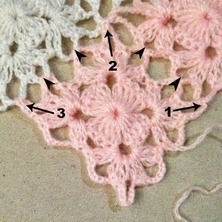 If you wish to make larger and larger shawl, add 1 or 2 or 3 more motif rounds. It’s your choice. 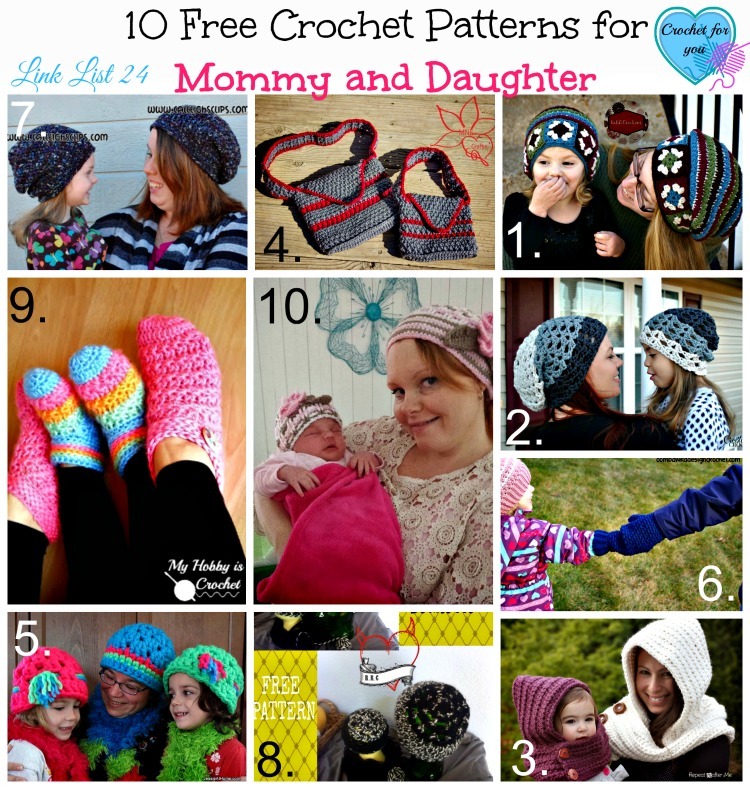 For the best yarns, check out the yarn collections on Knit Picks, Craftsy and Annie’s. To finish shawl pattern with fringe. 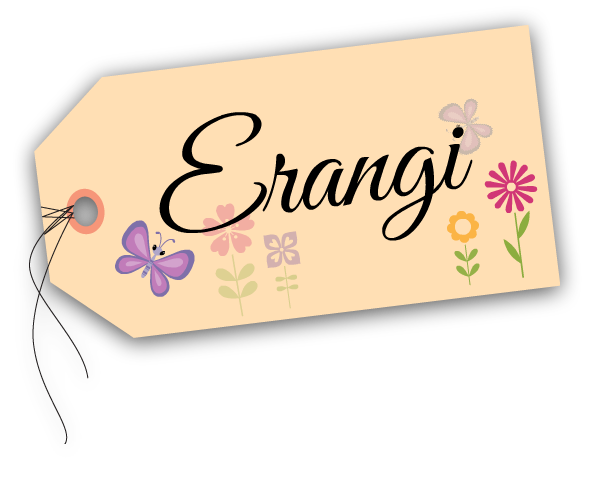 How to make a fringe by Just be happy! 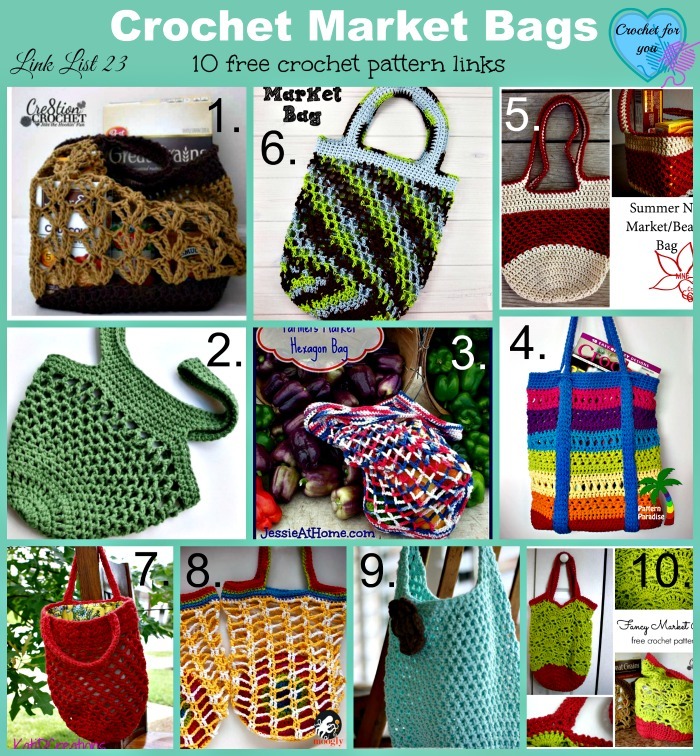 Share your WIP, finished projects on Fb page >> Crochet For You. Tapestry needle to sew in ends. Full instruction for the individual motif. 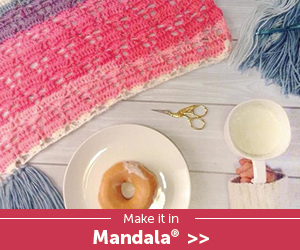 The pattern with joining motif has explained in every time in Shawl pattern so you no need to worry about this pattern instruction. 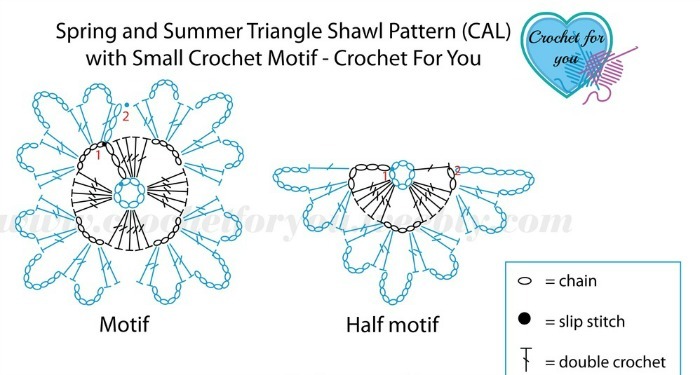 We only use round 1 and bolted part of the below pattern (full and half motif) instruction when we crocheting shawl pattern. ch 8, sl st to first ch from hook (made a ring). Round 1: ch 5 (count as a dc and ch 2), 5 dc, ch 5, 5 dc in ring, ch 2, 1 dc in ring, turn. Round 2: ch 12 (count as a dc and ch 9), 2 dc in ch-2 space, ch 6, 2 dc in same ch-2 space, (2 dc, ch 6, 2 dc, ch 9, 2 dc, ch 6, 2 dc) in next ch-5 space, (2 dc, ch 6, 2 dc, ch 9, 1 dc) in last ch-2 space, fasten off. Round 1: ch 3 (count as a dc), 4 dc in ring, ch 5, [5 dc in ring, ch 5]3 times, sl st to ch 3 top. Turn. Round 2: ch 3 (count as a dc), 1 dc in ch-5 space, ch 6, 2 dc in same ch-5 space, ch 9, 2 dc in same ch-5 space, ch 6, 2 dc in same ch-5 space, [2 dc, ch 6, 2 dc, ch 9, 2 dc, ch 6, 2 dc in next ch-5 space] 3 times, sl st to ch 3 top and fasten off. 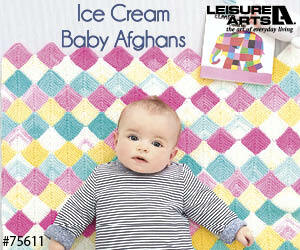 All the motifs start with round 1 in above pattern instructions of half motif and full motif. 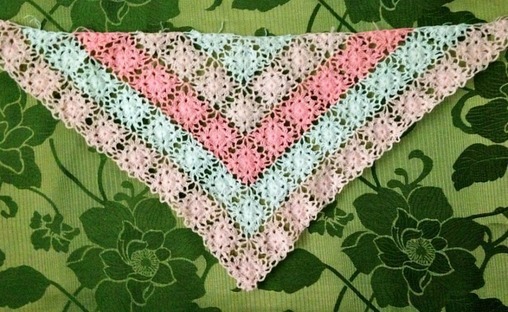 Add 1 or 2 or 3 more motif rounds, if you wish to make larger and larger shawl than this. It’s your choice. Follow half motif round 1 with color 2. 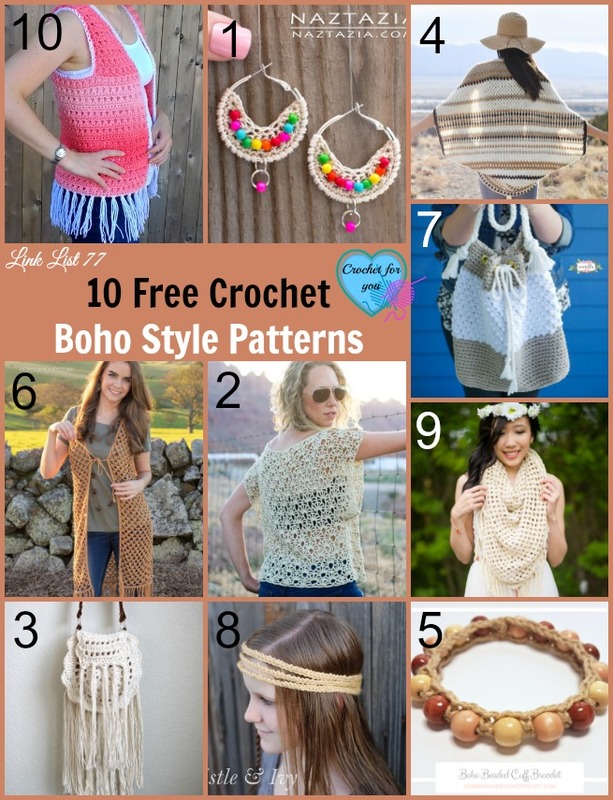 1. ch 3(count as a dc), crochet 4 chains, drop the loop off from hook, insert the hook in remained and unjoin ch-9 space of the first half motif in previous round, pick up the loop, pull through, ch 5, 2 dc in ch-2 space now you working motif. ch 6, 2 dc in same ch-2 space. 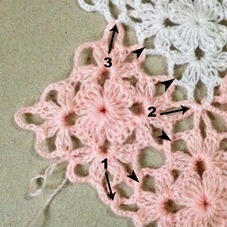 Work rest of the pattern (bolded part) in round 2 of half motif. Follow full motif round 1 with color 2. Keep in mind. 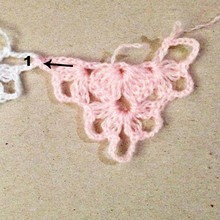 We are going to join with the previous motif we just crocheted and fasten off. Work rest of the pattern (bolded part) in round 2 of full motif onetime. sl st to ch 3 top and fasten off. Follow full motif round 1 with the same color. Work rest of the pattern (bolded part) in round 2 of full motif one time. sl st to ch 3 top and fasten off. 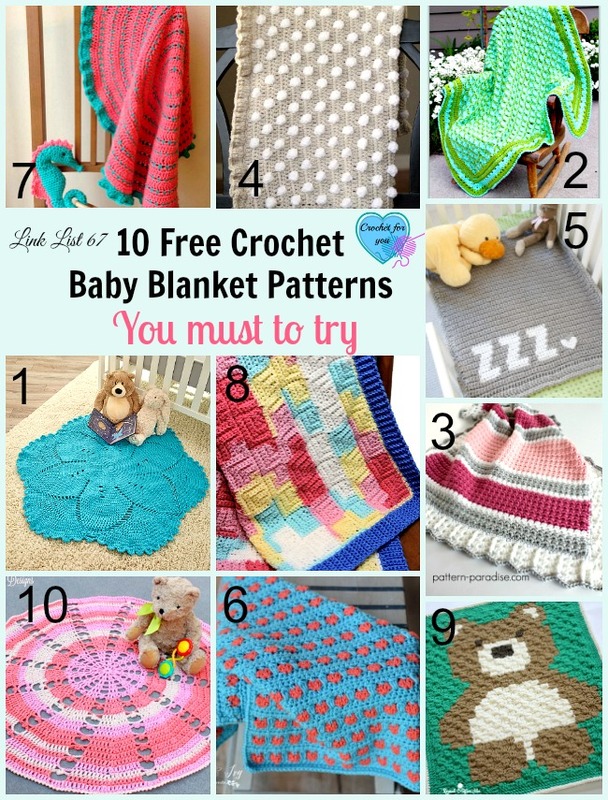 We are going to join with the previous motif we just crocheted and fasten off. Work rest of the pattern (bolded part) in round 2 of full motif two times. sl st to ch 3 top and fasten off. When joining first ch-9 space remember to skip lower pointer ch-9 space of previous (center) motif. Select the next ch-9 space does not join and placed in now you working side. 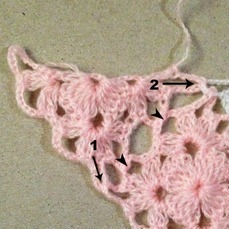 2. crochet 4 chains and drop the loop off from the hook, insert the hook in ch-9 space of motif placed in next to the previous motif (above)and has joined with previous motif (center motif in previous round we made), pick up the loop, pull through, ch 5, 2 dc in same ch-5 space now you working motif. 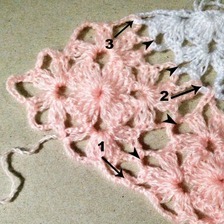 Crochet rest of the pattern (bolded part) in round 2 of full motif onetime. sl st to ch 3 top and fasten off. When joining first ch-9 space remember to select remained and unjoin ch-9 space of the previous motif placed in now you working side. Follow the full motif round 1 with the same color. 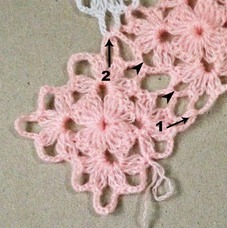 Start with same color, Crochet half motif round 1. 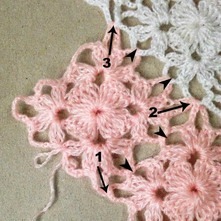 2. crochet 4 chains, drop the loop off from hook, insert the hook in next ch-9 space of the half motif in the previous round. (next to the previous motif and has joined with the previous motif). 1 dc in same ch-2 space now you working motif, Fasten off. Weave the ends in all motifs. Weave the ends in all motifs. Start next round with the same color. Work in around the motif edge with color 2. Join the yarn one of ch-9 space of the half motif placed on two sides of the shawl. Row 1: ch 3, 2 dc in same ch-9 space, ch 3, sl st to same space, *[ch 10, sl st to next ch-6 space] 2 times, ch 10, sl st to ch-9 space, ch 3, 1dc in same space (near to next ch space), 1 dc and ch 3 in next ch-9 space, sl st to same space (near to previous ch space)* repeat *to* until last full motif. 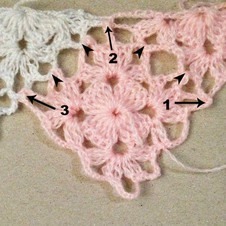 After crochet 2 dc in each ch-9 space, move and closer them by hands. [ch 10, sl st to next ch-6 space] 2 times, ch 10, sl st to next ch-9 space, ch 3, 2 dc in same ch-9 space, ch 3, sl st to same space.